England batsman Kevin Pietersen will miss the rest of the one-day series in Australia after suffering a fractured rib in their opening game. He was hit by a ball from Glenn McGrath as he advanced down the pitch during Friday's match in Melbourne and will be out for three to five weeks. 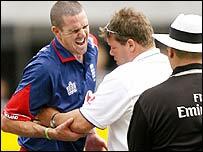 Pietersen continued his innings after treatment from team physio Dean Conway but was out soon after for 82. He was then sent to hospital for a scan which confirmed the fracture. "I have been hit quite a few times in my career and I thought I would be okay with a bit of ice. "When it hit me I couldn't breathe for a couple of minutes but I knew it was a bit more serious than previous times. "It restricted my breathing and it restricted my strokeplay which was frustrating because I wanted to get a hundred," said Pietersen. "I'm really down at the moment to be leaving Australia without a victory under our belt. Every single one of the guys is hurting but they will come our fighting." Losing Pietersen is a massive blow to England's chances of reaching the final of the triangular Commonwealth Bank Series, which also involves New Zealand. Prior to the game in Melbourne, Pietersen had scored 1,500 runs in 41 one-day games at an average of 55, and with a strike rate of 95 per 100 balls. His tactic of going down the wicket to McGrath in order to try to prevent him settling on a consistent length was one which he tried during the Test series against Australia, but cost him his wicket in the first innings in the final Test in Sydney. He tried it again as England looked to set the home side a challenging target at the MCG, but made no contact as he swung across the line and the ball struck him in the ribs. 606 DEBATE: Who should replace Pietersen? Pietersen, who was 73 not out at the time, immediately clutched his right side in agony, raising fears that the injury might be serious. But the prognosis for his recovery means he should be fit in time for the World Cup, which begins in the Caribbean on 13 March. "I'll go home and get my fitness back as fast as I can and come back stronger for the bigger picture, which is the World Cup," he added. England now need to call up a replacement but when asked who he thought it should be, Pietersen replied: "I'm no selector. I'm just distraught to be going home."